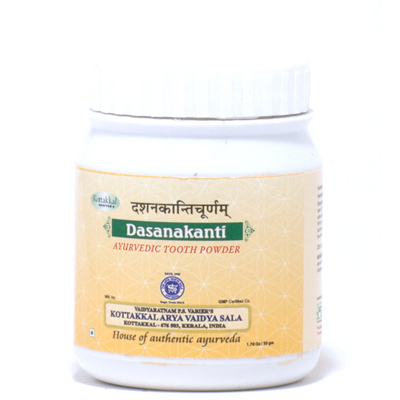 This Powder is made of Clove and other antiseptic herbs which help to disinfect the hard to reach areas of the teeth and gums. It can be helpful when an infection is in the teeth or gums and thus are bleeding and inflamed. However, it is more of a preventive medicine and can be part of a daily routine to strengthen the teeth and build up the immunity in the mouth. This is not a replacement for toothpaste, if you are prone to cavities or have history of dental problems. Every individual is different, therefore please use as an herbal supplement. Directions of Use: Scoop powder onto finer or toothbrush and rub onto the gums and teeth, especially the gum line. Continue for 2-3 minutes for maximum benefit. The longer you keep in the mouth, the better. Twice a day is best. There are no known side effects with this product. Accidental ingestion by children should be avoided.